Murietta's Well - Write for Wine: It's Wine O'Clock Somewhere!Write for Wine: It's Wine O'Clock Somewhere! This is the third vintage of The Whip that we have tasted and recommended to friends who like crisp whites with a touch of sweetness. The Whip blends 30% Semillon and 30% Chardonnay with 30% Sauvignon Blanc for natural acidity, and with 7% Viognier and 3% Muscat Canelli to provide fruit and floral expressions. Aromas of ginger, citrus and floral notes open up to textured flavors of pineapple, lemon and stone fruit, with a touch of minerality. The Whip is a food-friendly wine to pair with summer salads or seafood. Or you could enjoy this blend on its own on the deck. The 2014 vintage offers more Cabernet Sauvignon and less Petite Sirah than the previous year, and it is even more delicious. This unique red wine blends 45% Cabernet Sauvignon, 22% Petite Sirah, 14% Petit Verdot, 10% Merlot and 9% Cabernet Franc. In other words, the Cab Sauv forms a beautiful foundation for the other varietals. A delightful array of aromas — red fruit, baking spices, clove, licorice, vanilla, coffee and cocoa — represents the numerous varieties in this intense blend; they are followed by notes of earth, oak, spice, cassis and plum. This big wine will pair well with roasted or grilled meats, dishes with red sauces, or rich blue cheese. What a lovely rosé — you just might want to drink it poolside or on the lake all summer. The nose has whiffs of orange cream, rose petals and strawberries, leading to flavors of watermelon, strawberries, cherries, citrus and juicy red fruit, with a hint of herbs and minerality on the finish. A blend of 55% Grenache and 45% Counoise, this wine will pair well with salmon or any light, warm-weather dish. Call this is a Merlot for Cabernet lovers, which makes us very happy. This is a rich, silky Merlot — 90% Merlot, 7% Cabernet Sauvignon and 3% Petit Verdot. Aromas of plums, blackberries, raspberries, herbs, cocoa and baking spices are followed by flavors of vanilla, mocha, juicy black fruits and spice on a long finish. This is a food-friendly wine — pair it with grilled ribs, lamb chops, pot roast or barbecued beef ribs. We love Cab Franc – it is one of our favorite wines in the world. This one consists of 88% Cab Franc, topped off with 6% Cabernet Sauvignon and 6% Petit Verdot. It’s a classic wine, with stunning aromatics and flavors of white pepper, herbs, dusty earth, olives and dark fruit. The palate is silky and elegant. Pair it with barbecued chicken, pork, beef, sausage, lamb, veal and hearty fish dishes. 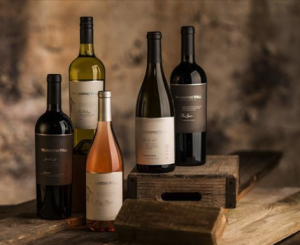 After tasting all these wines, we think you can count on Murrietta’s Well for both white summer sippers and red wines for your barbecue parties. This entry was posted in Bordeaux Blend, Cabernet Franc, Cabernet Sauvignon, California, Chardonnay, Counoise, Grenache, Merlot, Petit Verdot, Petite Sirah, Sauvignon Blanc, Sémillon, Viognier, Wine and tagged Cabernet Franc, Cabernet Sauvignon, Chardonnay, Counoise, Grenache, Livermore Valley, Livermore Valley Wine Country, Merlot, Murietta's Well, Muscat Canelli, Petit Verdot, Petite Syrah, Robbie Meyer, Rose', Sauvignon Blanc, Semillon, The Spur, The Whip, Viognier, Wente by Margot. Bookmark the permalink.